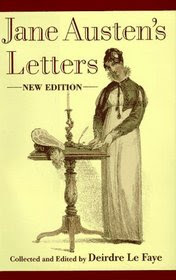 I’m reading Jane Austen’s Letters and there is something about them that makes me want to grab my fountain pen and some nice thick letter paper and write somebody a chatty letter. I’m rather torn because I like the convenience of writing one blog post or one Facebook post to tell hundreds of people (or at least the five who read my blog) about anything interesting (or not interesting) that has happened to me. Any of you still write letters? Oh my gosh, totally! That's something I hadn't really thought of before! I used to write letters all of the time. I haven't done as well with that as I used to. I have a beloved cousin and we've been writing back and forth for over 40 years.